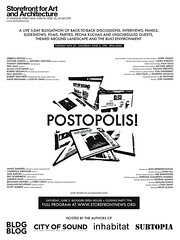 On June 2, I will be speaking at Postopolis!, an event organized by Geoff Manaugh (BLDGBLOG), Bryan Finoki (Subtopia), Dan Hill (City of Sound), and the kind folks at Inhabitat. Let me just say right now, I had no idea that the roster was going to be like this. I was honored when Geoff first extended the invitation. But, wow. Really. Wow. The event will be at the Storefront for Art and Architecture, 97 Kenmare St., New York, NY 10012. More details forthcoming. So, please stop by and say hello. thats funny enrique that is exactly how I felt. At first I thought it sounded like a good conference and then saw the line-up and was floored.